Pets aren’t immune to holiday-related stress. Even the most easy going pup may become stressed as a result of traveling or having new guests in the house. Sometimes these situations are unavoidable during the holiday season, but pet parents can keep their pets calm by taking the chaos out of an overwhelming situation. Diffusing stressful situations by creating a stable living environment can help prevent the onset of digestive issues, such as vomiting and/or diarrhea. Dr. Catherine Lenox, a veterinary nutritionist and Royal Canin Scientific Affairs Manager notes that gastrointestinal issues in dogs and cats are especially common during the holiday season. "When there is additional stress such as house guests or boarding, as well as more food around the house – including foods that humans can eat but that are toxic to pets – there is an increased risk of gastrointestinal disturbances in our pets." Gastrointestinal disturbances are one indication that your pet may be stressed, but other signs include a poor appetite or decreased interactions. An influx of holiday visitors and a busier-than-usual home can often bring about stress in pets. 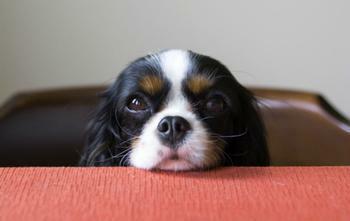 Here are a few tips for minimizing your dog’s stress in a guest-filled environment. Play with your pet beforehand. Take a break from preparing for guests and spend some quality time with your pup. Whether you take your pet for a walk or engage in a round of backyard fetch, you’ll be helping to release some energy. A well-exercised dog is more likely to take a nap after your guests have arrived. Aim for calm introductions. Consider putting your pet in a room with the door closed until all your guests have arrived. You could even try putting on a video designed to help dogs relax. Then, bring your pet out on a leash and allow Fido to greet guests one at a time. But don’t try to force introductions. Reward calm behavior. Keep treats handy to give your dog when he or she displays calm behavior, such as laying down. You can even offer visitors a treat to dole out as soon as your dog does the “sit-stay” command.